I have the best family and friends. Remember me saying that the wedding is small, informal, casual, not a lot of 'tradition' like bridesmaids/ushers, no shower/bachelorette party, etc? Well, my wonderful family and friends conspired - with SP's help!!! 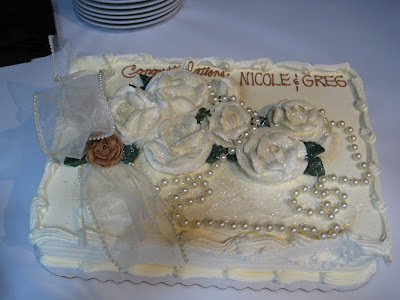 - and threw me a surprise bridal shower this past Saturday. Apparently, back in January and February, a friend of mine started plotting. Let's call her PM. When SP texted a bunch of people after my surgery in January, PM then had his phone number. She got in touch with him and got my mom's phone number. Then my mom and PM proceeded to plan a surprise bridal shower and enlisted SP for help. Since he was in charge of mailing the wedding invitations, he was able to copy down all the names & addresses, which he forwarded to PM and my mom. I have to say I was completely surprised, although I did notice a few 'odd' things the past couple of weeks, but I've been so busy and my mind so preoccupied that I never managed to connect the dots. 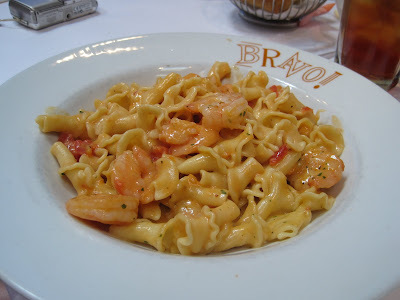 Anyway, my mom got me out of the house yesterday under the pretext of doing a bit of shopping at the mall and then meeting a friend of hers for lunch at Bravo. 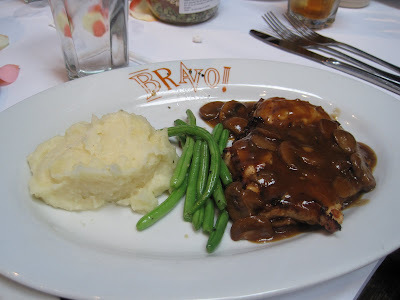 When we got to Bravo, the hostess led us to a private dining room. I started to stop and say, no, this is wrong, this is set up for a party of some sort, and then my eyes managed to focus and my brain managed to compute and I slowly recognized faces and realized what was happening! Small wedding = small shower (some out of town people couldn't make it) but it was so amazing to see the people who were there. My biggest surprise was that EPAS came in from Philly for the shower. 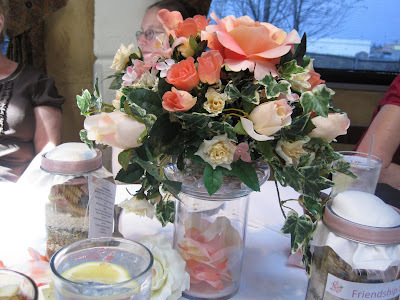 The table had a beautiful centerpiece of peach flowers (see first photo above) with some peach petals scattered on the table. 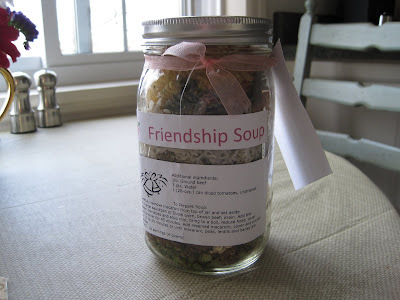 Another friend, SF, made the favors, which were jars filled with ingredients for 'Friendship Soup.' 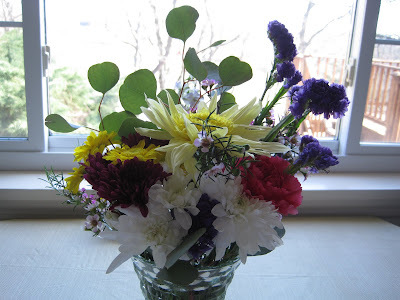 SP showed up briefly to say hello to everyone and he gave me a beautiful bouquet of spring flowers. I was teasing him that my bridal shower is the first time he has ever given me flowers!! I was so impressed with him: despite it being Saturday and a day off from work (and despite it being his first weekend day 'on call' per the crazy new work rule of someone needing to be available to fix the test runs if they crash/go down), he put on his nice, new jeans and his nice, new polo shirt and even put a bit of gel in his hair (I really like when he uses a bit of gel!). 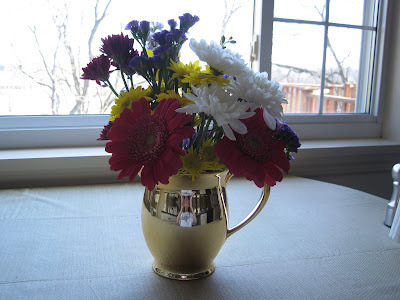 I spent some time today cutting the flowers and dividing them between 2 vases. We had a lovely luncheon. 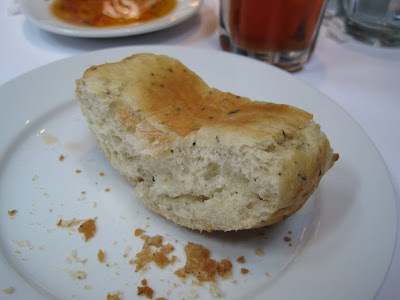 Of course there was the Bravo bread (and dipping oil, which is in the upper left background): Everyone got to choose soup or salad to start. The soup was wedding soup. 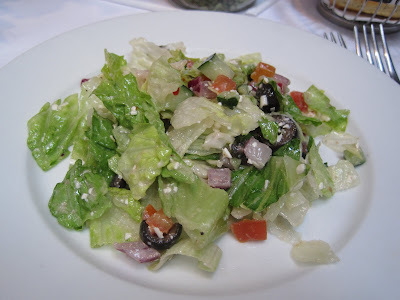 I chose salad: I like Bravo salads, although I did pick out the onion! 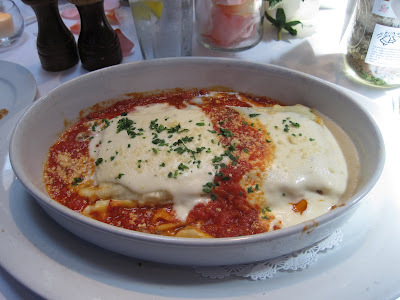 Lasagna: Shrimp Fra Diavolo: Chicken Parmesan: And Pesto Tortelloni, which no one ordered, so no photo. 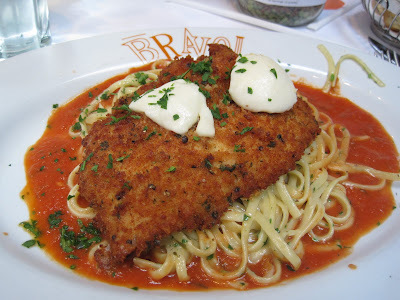 I enjoyed the chicken parmesan, which was quite tasty, especially the cheese dollops on top!! All of the portions were huge, even the lunch portions, so everyone took some food home. Dessert was a beautiful cake. It was white cake with raspberry filling between the layers and a wonderful creamy icing. Then it was time to open presents! Presents are always fun, and I truly appreciate each and every gift I received. We got some new kitchen goodies and gadgets plus I got some lingerie (naughty & nice, according to PM!). The most special gift is one from my mom, neither lingerie nor a traditional registry gift, but something that I knew was in the safe deposit box and that I knew she was waiting to give me at the right time although I had forgotten about it, and apparently the right time was yesterday! I'll keep the details to myself, though, because it has a lot of meaning to me but probably no one else would really understand. After food and presents, everyone chatted for a while and then it was time to go. When mom and I got home, SP helped unload the car and then we all freshened up a bit before heading over to SP's dad's place. The boys were all meeting the girls there after the shower (news to me!) and it was nice to hang out with everyone. SP's dad got some pizza so we enjoyed some pizza and wine. I always enjoy visits with EPAS because she and I were good friends in high school even though she was a year behind SP & I. We have good talks and lots of laughs - it's almost like we never lost touch for 15 years after high school!!! It was a wonderful, surprise-filled Saturday and I am definitely looking forward to the wedding which is in 2 weeks!!!! I hope the weather is as fabulous as it has been this past week. But no matter - even if it rains or even snows (please no), I'll be marrying my Sweetie Pie so it will be a wonderful day! So exciting! Your shower was the same day as my sisters!! Looks lovely, and yes, you should have a shower!! What a sweet surprise. Best wishes with everything in the next two weeks! It will fly by. Hope you'll share more details!